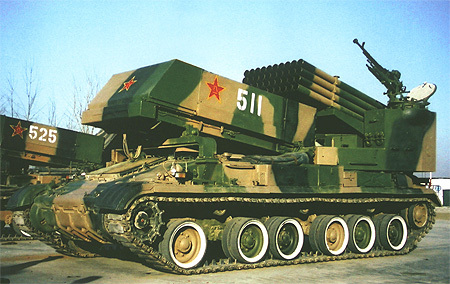 During the 1979 Sino-Vietnam border conflict, Chinese Forces captured Russian BM-21 Grad MLRS vehicles. In true Chinese fashion the vehicle was reverse engineered in to the wheeled Type 81. The launcher was then copied on to a tracked based vehicle as a prototype by 674 Factory and 5137 Factory in the 1980’s. It was field tested and adopted by the PLA in 1986 as the next-generation artillery rocket system for its armoured forces. Trials in a weapon testing base and field units were carried out in 1988, with a total travelling distance of over 30,000km and 707 rounds fired. In February, the weapon was approved by the State Council and Central Military Commission for production, and weapon was officially designated PHZ89. The PHZ89 is mounted on the Type 321 utility tracked chassis and powered by a WR-4B 520hp liquid-cooled diesel. The chassis has six unevenly spaced road wheels and three track support rollers. The system has a combat weight of 30t and a maximum road speed of 55km/h. The system is operated by a crew of five men, who are protected by limited armour protection and a centralised NBC-protection system. The electrically powered launcher has four rows of 10 tubes mounted above each other on a rotating cradle assembly. The launch tubes have an elevation range of 0° to 55° and azimuth range of -102° to +66°. The electrical firing system fires the rockets in either single or in salvo with 0.5 seconds interval. The Type 81 can fire 40 rockets in 20 seconds. The automatic reloading system can reload the launcher within 3 minutes. The secondary weapon is a 12.7mm/50-calibre antiaircraft machinegun mounted on the cupola of a small machinegun turret located on the left of the launcher. Firing accuracy is attained by a computerised fire-control system, which can receive target information automatically from the command vehicle, or by manual input. The fire-control computer then calculates the ballistic and adjust according to the vehicle’s slope and gradient before launch.